This is an unusual foray for me, into the realms of ‘guest posts’….its not something I tend to do. My blog is for me, its my journal and a chance to share my food experiences but with this post I have made a special exception for my friend who I asked to write about her attempts to give up plastic for lent. I bumped into her in the supermarket on day one of her attempt and we chatted about the issue of over packaging. I have taken drastic steps on occassion, tearing off unneccesary packaging and leaving it at the checkout…but this doesn’t deal with the issue that it will be thrown away. If not in my house, then at the supermarket. Vashti’s experiences mirror those of many working parents battling their personal ethical dilemmas with the demands of young children, work, time constraints and wishing to avoid the supermarket but feeling inevitably drawn there through the lure of convenience. Vashti’s story highlights a need to tackle supermarket over packaging, it is a challenge they should be finding solutions to. There are plenty of alternatives…compostable cellulose and paper bags are just two alternatives. I use them and I run a very small business…surely they can afford to make the chnage? Vashti Zarach is a mother, storywriter and librarian. She spends her days dashing around after two lively small children, supporting Bangor University’s College of Natural Sciences with library and information hunting skills, and attempting to do a bit of story writing during the fleeting moments when the baby is actually asleep. Earlier this year, I read a book called Seasick by Alanna Mitchell, about the terrible impact human activities are having on the world’s oceans, so when we decided to do a display on Junk at my workplace (a university science library), I was keen to do a section about marine litter. 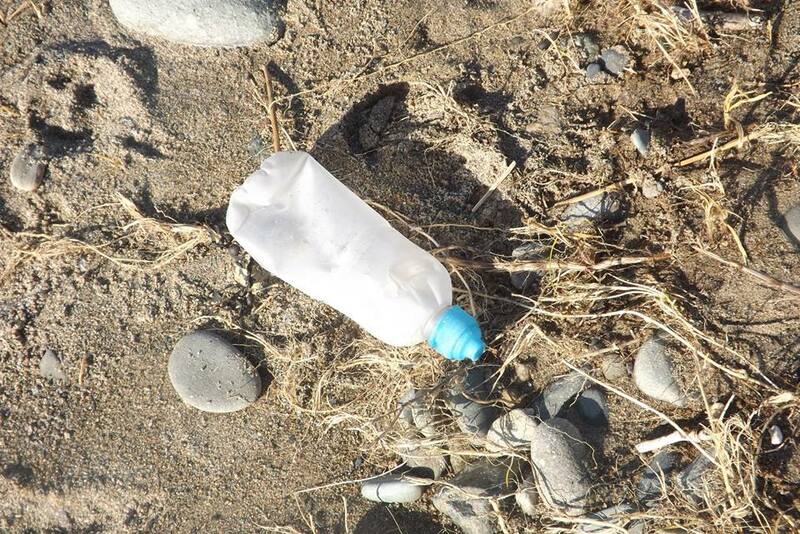 In addition to preparing information posters featuring photographs of litter on local beaches, and making a display of toy sea animals on a miniature beach strewn with rubbish, I contacted the Marine Conservation Society to ask for some leaflets about their work. They kindly sent the requested items, and asked whether I would like to join in with a challenge originally devised by Sea Champion Emily Smith to live plastic free for Lent. During my research into marine litter, I had been shocked to discover how much plastic ends up in the sea, harming marine creatures and taking hundreds of years to break down, so I was instantly keen to participate. The day before Lent began, I took my children to play on a local beach, where we once again marvelled at the sight of plastic crisp bags and other human debris thoughtlessly scattered on the sand. On the way home, we passed Waitrose, so I decided to begin the challenge there. This first shopping trip was a huge eye opener. I am a vegetarian, and frequently opt for organic, UK grown, or fair trade food, but have never considered packaging issues when shopping. I was amazed how much our choices were restricted, and surprised to find only plastic bags available for gathering loose fruit and veg (my son and I collected loose items and put them straight into the trolley). We were unable to find many plastic-free options in the dairy section, until we discovered cheese in wax, and decided to allow butter to be an exception to the challenge (wax paper is not recyclable, nor is it biodegradable due to petroleum). We chose unwrapped bread, boxes of eggs, and various glass jars of chutneys and jams, and made the initial mistake of selecting cakes in cardboard boxes (forgetting that they were wrapped in plastic inside the boxes). Waitrose staff were very amenable, and weighed loose shopping at the counter without complaints. We bought reusable canvas shopping bags, and my shopping was cheaper than normal, as so many of the things I would usually buy were wrapped in plastic. We were unable to find nappies which passed muster at the supermarket, or any loose potatoes, so stopped at Dimensions, a health food shop in Upper Bangor, on the way home, where we found biodegradable nappies, loose potatoes, and even bamboo toothbrushes. However, in order to best dispose of the biodegradable nappies, I realised I would need to begin composting. Plastic free shopping is a gateway leading into a whole new world of waste reduction practices. Over the next few weeks, we continued with the mission. I accidentally broke my challenge in the first week a few times, for example buying birthday cards (why are they all individually wrapped in plastic?) 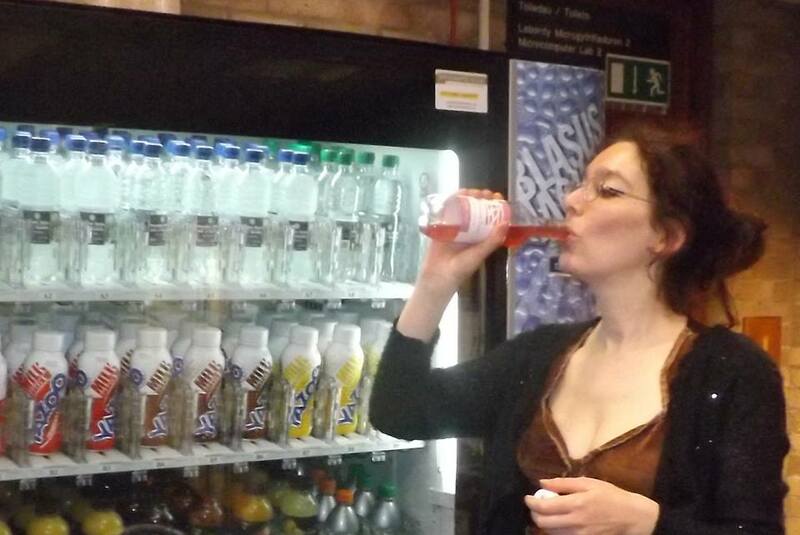 and accidentally buying a bottle from the drinks machine at work (it’s amazing how differently you feel about a bottled drink when you are aware that it takes 450 years to decompose). My husband complained that our son, who had been accompanying me on shopping trips and learning alongside me, was refusing to let him buy anything wrapped in plastic packaging. 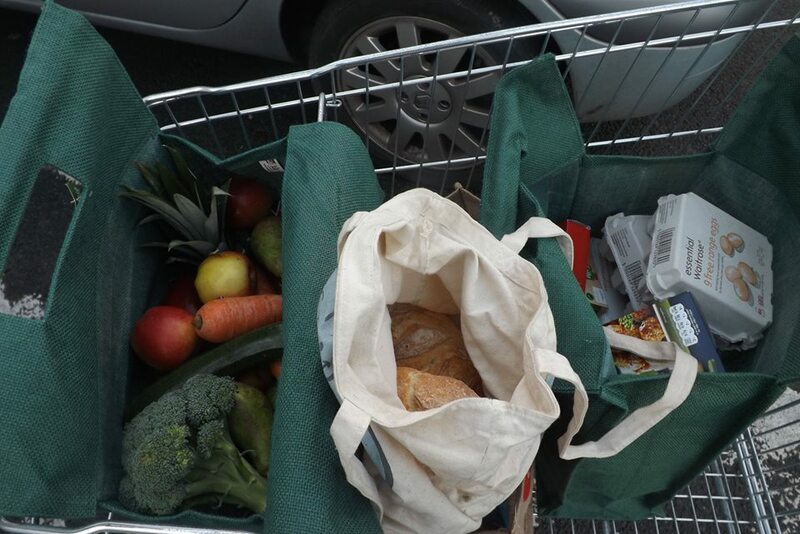 We enjoyed our plastic-free shopping trips very much – the canvas bags full of loose veg, artisan cheese, and unwrapped loaves looked wholesome, tasted delicious and made us feel that in a small way we were helping to look after our environment. The most difficult aspect of the challenge was feeding myself and my family when on the move. I found myself bemoaning the UK’s lack of a street food culture, leaving busy people dependant on plastic-wrapped takeaway sandwiches and drink bottles. Oddly enough, the only other place I have seen street food mentioned recently was here on Denise’s blog. I mostly managed by carrying breadboards and knives with me, and slicing up fresh bread and cheese to make sandwiches on the go (I know some parents make packed lunches, I have just never been that well organized!). I fully intended to buy local fruit and vegetables from markets, rather than depending on supermarkets. Due to my busy schedule, I never managed to do this in the initial weeks of the challenge, so this is something I ought to explore further in the future. After a few weeks, I cracked, and bought some Bad Plastic Wrapped Food. I have two very young children and a hungry husband, I work part time, and was tired and fancied a week with some easy-cook staples such as pasta and frozen food. I was also missing my usual organic vegetables, which were only available in plastic wrapping (as is often the case when trying to shop ethically, there are often all kinds of different considerations to balance out). And we’d run out of toilet rolls. So, is that it? Do I intend to return to my normal shopping habits, selecting food without giving any thought to the eventual destination of any non-biodegradable packaging? Or am I happy to live on a restricted, plastic-free diet, feeling an inner glow at the thought of all the small sea creatures spared from environments full of trash by my virtuous behaviour? Well, I hope to aim for a balance, avoiding plastic packaging as much as possible, but having occasional plastic splurges to top up on staples and treats. I recommend reading up on the impacts of your consumer packaging choices, and giving plastic free shopping a try. You’ll discover new foods, your shopping may cost less (I saved money), and the starfish and sea urchins and sandy beaches of our beautiful planet can only benefit. Many individuals add up to giant waves, we can make an impact together.